Where can I check my New Look gift card balance? You can get a make a balance enquiry to get your New Look gift card balance online here. Click here to check your New Look gift card balance online. New Look is the UK’s leading fashion store with 584 UK stores, you’ll find a New Look on a major high street near you. Have a look at the store finder to find your nearest New Look. 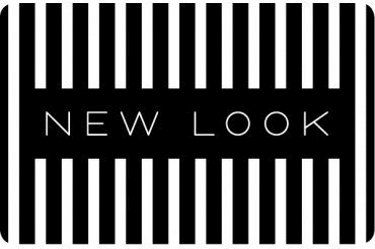 New Look has celebrity design partnerships and is committed to making the latest trends and hottest celebrity looks available to everyone –regardless of age, size or how they want to shop. You can buy Men’s fashion too in all New Look stores and online. To check your giftcard balance online, you’ll need to quote the card number from the back of the card and also enter the PIN which you will find under a scratch panel on the back of the card. You can also present your card at any New Look store in the UK to find out your balance. You will not need your PIN for this. Where can I buy a New Look giftcard? You can buy a New Look gift card from any New Look store in the UK. New Look gift cards are also on sale in major supermarkets, including Sainsbury’s, Tesco and Morrisons. You can buy a New Look giftcard directly from their official website for delivery by post. Delivery charges start at £1.80 up to £6.95 for special delivery. As well as traditional plastic gift cards by post, they also sell digital giftcards (yay!) which are delivered pretty much instantly by email. Where can I spend my New Look gift card? New Look gift cards can be redeemed in any New Look store in the UK. The card is also available for use on their website. There is a PIN number under a scratch panel on the back of the card for use online. You don’t need the PIN when redeeming the card in store. Does a New Look gift card expire? Yes – New Look gift cards are valid for 24 months from the time of purchase. The clock is re-started with each transaction, meaning that if you make a purchase with the card, any balance remaining on the card lasts for 24 months. After that, the balance will be lost. A balance enquiry does not count as a transaction or extend the validity date with a New Look gift card. Top up-tip: You can ‘top up’ a New Look gift card at any New Look store, so if you’re not ready to spend it just yet and are concerned about it expiring, you can make a top-up in store to add another 24 months’ validity to the card! If you’re a full time student, lucky you! You can claim 10% off full price items at New Look.